This table is brought to you by the Brunswick manufacturing company. Brunswick is mainly known for another popular bar table game, the pool table. 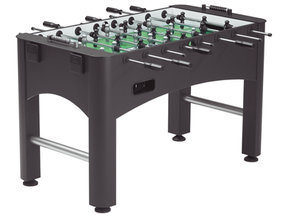 Their name is not synonymous with the game of foosball but they do make 3 different table models. 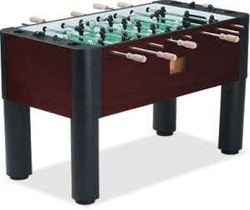 The Scorer table comes in at the middle of their foosball table line with a heavy duty cabinet design. The original model of the Scorer lacked the adjustable leg levelers as shown in the image below. However, Brunswick is constantly improving their product and this has been upgraded in the model being sold today. 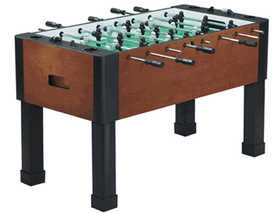 This foosball table is priced at $1,100 US.